Pacific Ocean Aquafarms hopes its aquaculture venture will provide valuable data for future of seafood industry. SAN DIEGO — An offshore project spearheaded by Hubbs SeaWorld Research Institute (HSWRI) could provide valuable information for the future of U.S.’s aquaculture industry. Whether the proactive attempt to redefine the country’s seafood production and supply is successful is contingent upon a full endorsement by the federal government, but Pacific Ocean Aquafarms, in the meantime, hopes to gain the Port of San Diego’s ear. Pacific Ocean Aquafarms, an aquaculture company based in California’s Imperial County and lead by HSWRI, is expected to have its fish farm project proposal heard at an upcoming port district board meeting. Commissioners were initially set to review the project at their Sept. 12 meeting, but the agenda item was deferred to a later date. Port district considered aquaculture “a growing opportunity for new business development in Southern California. The port district has been making a push, recently, for aquaculture projects through various “Blue Economy” initiatives. Offshore fish farming is one of several projects under the Blue Economy umbrella; proposals for marine debris removal, ocean monitoring technology and oil spill prevention were also submitted to the port district for Blue Economy funding. The Pacific Ocean Aquafarms project, should it be green-lit, could have a positive windfall for the port district and overall San Diego region. “This project, with its proximity to a major U.S. city and an extensive seafood market, has the potential to be a regional-based model and an early proving ground that can provide an invaluable data base of information that could advance the aquaculture industry nationwide,” port district staff stated in a report to the Board of Port Commissioners. Various policymakers, thought leaders and academics have, in the past few years, advocated or made the case for fish farming in federal waters as a means to increase domestic production and supply of seafood. 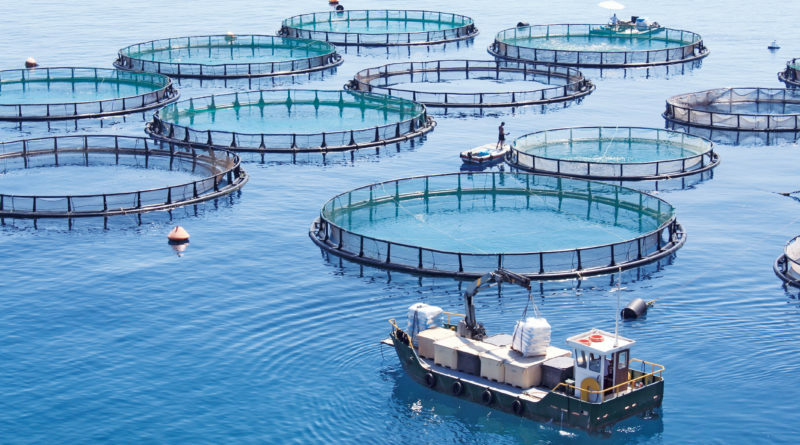 Ramping up offshore fish farming or aquaculture projects in the United States, it has been argued, would help reduce the U.S.’s reliance on imported seafood. “The aquaculture opportunity is being driven by the need to support development of sustainable domestic marine aquaculture industry,” port district staff stated in a report to board members. “The U.S. currently imports over 91 percent of the seafood it consumes. In economic terms, these imports consistently contribute to over a $14 billion domestic seafood trade deficit each year. Strengthening the domestic supply of seafood via fish farming is not aquaculture’s only benefit, according to port district staff. “While there is a clear food production component to this demand, aquaculture offers multiple co-benefits, such as fisheries enhancement, ecosystem restoration, mitigation banking, bio-fuel/medical purposes, bioremediation, and education and outreach,” the port district staff report stated. This is not HSWRI’s first attempt to present its plans to the Port of San Diego. HSWRI sought an opportunity to “demonstrate sustainable offshore aquaculture in federal waters” through Rose Canyon Fisheries in 2017. Fast forward to September 2017, HSWRI has now partnered with Imperial County’s Pacific Ocean Aquafarms in hopes of bringing an offshore aquaculture project to the San Diego area. Pacific Ocean Aquafarms still needs to complete a federal permitting process. The project cannot go forward without Pacific Ocean Aquafarms earning approvals for those federal permits. Tenth Avenue Marine Terminal would be used as the project’s loading and offloading site, should the project earn its federal permits and eventually go on-line. The port district would earn revenue from Pacific Ocean Aquafarms’ use of Tenth Avenue Marine Terminal. One website for Pacific Ocean Aquafarms Corp. – pacificaquafarms.net – is currently live and functioning. A second website – poaquafarms.com – came online this year but is still under development. The Log will follow-up with this story when the Port of San Diego’s Board of Port Commissioners deliberates the Pacific Ocean Aquafarms agenda item.